Recruiters know that time is a precious resource. Time with hiring partners and candidates is invaluable to achieve hiring success. But the many variables we juggle — changing requirements, shifting timelines and candidates’ busy schedules — can easily eat up that time. Simplifying applications, improving your processes and leveraging technology to help automate the repetitive tasks free you up to do what you do best: help people get jobs. Here are five ways to improve your productivity right now. 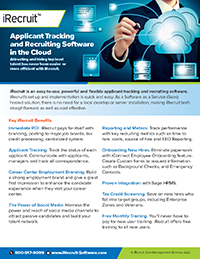 Onboarding software is technology used to help employers communicate with new hires, and track the status of any assigned tasks or documents such as an I-9. Because it’s all done online, onboarding software can reduce the administrative burden on Human Resources departments, reduce costs associated with printing and mailing, and can increase the time to get everything done. The exact number varies from industry to industry, but the average time to hire across all sectors is 42 days. That means 42 days of a vital role in your organization left empty. This is far too long. Not only are you losing revenue, but imagine how many offers aside from your own a top candidate could field in the space of 42 days? The midterms were last week, and while some races are still to be determined, three states drastically changed their marijuana laws– Michigan legalized recreational marijuana and Utah and Missouri legalized medical marijuana. This will shift how recruiters conduct background checks and drug screenings. Here’s how the new laws will work, and what that means for HR professionals in each of those states. Starting anything from scratch is challenging. It requires planning, strategy and a whole lot of hustle. Heck – writing a blog post is no walk in the park ;). But if you’re reading this, it means you’re likely thinking about starting a company – or are part of a young company. And, building a company is a little more complicated than a blog post.